Follow charts and tide tables closely. It is recommended to navigate the Narrows at high slack only. Note that the entire North Coast area is closed to bivalve harvest (i.e. clams and mussels), due to red tide and the possibility of paralytic shellfish poisoning. Although swimming is possible in the park, it is not recommended, as the water is very cold. This marine park offers anchorage, fishing and diving in an attractive little bay suitable for small boats. There is a small beach here, but no facilities. The passage is narrow at the east end with rocks and drying reefs. Navigate only at high slack. Park Size: 30 hectares of marine area and 41 hectares of land area. 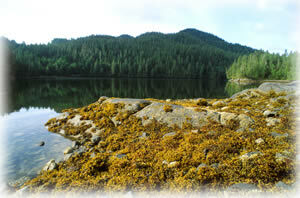 The park is 236 km south of Prince Rupert, at the east end of Jackson Passage as it joins Mathieson Channel. Refer to Canadian Hydrographic Charts 3734 and 3711. This park can be accessed only by boat. Klemtu is located to the west on Swindle Island, and supplies are available there. The nearest community with road access is Bella Coola. History - This park was designated in 1992. Cultural Heritage - This park is in traditional First Nations territory. Wildlife - As you cruise through the waters near the park, watch for orcas, Pacific white sided dolphins, seals and other marine mammals. Enjoy identifying the weird and wonderful creatures of the intertidal zone when the tide is low – sea cucumbers, nudibranchs, chitons, sea stars, molluscs, urchins and multicoloured algae. Please look, but do not disturb them or move rocks. On shore, watch for Columbia black-tailed deer, mink and wolves. Sea kayaking is possible, although access to the park is lengthy and requires experience - it would be better to use a motorboat to get to the inlet and use the kayak or canoe to explore the narrows and nearby bay. There is some fishing nearby for salmon and rock fish. Anyone fishing or angling in British Columbia must have an appropriate licence. This park is open to hunting. Please check the BC Hunting and Trapping Regulations for more information. There are SCUBA diving opportunities at this park. Firewood is not provided. If you must have a fire, please burn only dead and down wood, and be sure to extinguish the fire fully. Dead wood is an important habitat element for many plants and animals and it adds organic matter to the soil so please use it conservatively, if at all. You can conserve firewood and air quality by keeping your campfire small. Be prepared to bring a portable stove for cooking.